This junior-sized spiral bound promotional notebook features a fold-over cover with your imprinted logo. This Tri-Color Pocket Custom Notebook w/ Pen is the perfect promotional item for school orientations. The cover has 2 front pockets and one inside pocket, perfect for storing school work. A custom notebook with fashion color microfiber cover with contrasting black leatherette snap closure, Large inside front cover pocket, Includes 40 Pages of lined stone paper. These hard times require a durable, plastic cover logo notebook for your next event. Get your full color company logo out to your clients quickly and economically with these slimline custom journals. A custom journal with durable and impressive polypropylene cover and 100 spiral bound lined pages. Visualize your logo prominently imprinted on the bright translucent cover of this custom notebook. Envision your logo prominently displayed on the textured cover of these custom notebooks that will instantly draw attention to your brand. 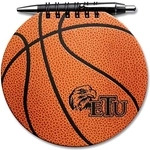 The Basketball sport promo journal makes a great promotional item or gift for that favorite team or a sports related event. This high-end Executive Leather Custom Notebook w/ Zippered Pocket makes the perfect gift for colleagues, employees, and clients. It includes an 80-page replaceable unlined notebook. Branded notebooks & promotional journals will keep your company organized. Custom notebooks are a great way to give your employees an extra boost of professionalism. The next time they meet with potential clients, they can carry a notebook with your company's logo prominently displayed. The small details count, and ePromos has your workforce covered. Give out notebooks, pens and journals in promotional bags at events and trade shows. They're a perfect accessory for sale in any school or university bookstore. Whether the recipients use them during meetings, class or to jot down ideas at their desk, they'll be thinking of your organization. When you need great looking notebooks and journals, ePromos has a full staff of experienced promotional product experts to assist. Contact us today or order online to get started.